The day-long visit by the External Affairs Minister Salman Khurshid to Kandahar on Saturday was a short one but nonetheless suffused with meaning. The occasion was the inauguration of Afghanistan’s first national agriculture university, which was a major Indian-aided project promised by Prime Minister Manmohan Singh in May 2011. Delhi kept in view the high importance that Afghan psyche attaches to friendships where pledges are unfailingly redeemed. Manmohan Singh had announced during his visit a fresh commitment of $500 million for Afghanistan spread over a six-year period. The project in Kandahar comes within the ambit of that pledge. The symbolism that surrounds Saturday’s ceremony in Kandahar is two-fold – Delhi has signaled that the expected political transition in Afghanistan and India should not come in the way of the inauguration of the Indian project. Put differently, Delhi has shown its high regard for President Hamid Karzai, while at the same time underscoring that India does not subscribe to the doomsday predictions that all hell will break loose in Afghanistan and a bloody civil war is ahead once the western troops leave by the end of 2014. This comes out very clearly more than once in Khurshid’s speech at Kandhahar. Khurshid made a six main points in his speech. One, he affirmed in the strongest possible way that India holds Karzai in high regard, notwithstanding the relentless western criticism of his leadership. Two, India accepts the legitimacy of the political transition in Afghanistan and views the forthcoming election in April as a manifestation of the vibrancy of Afghan democracy. Khurshid even drew parallels with the functioning of Indian democracy. Three, Khurshid resoundingly backed Karzai’s efforts at national reconciliation and his initiatives for an “Afghan-owned, Afghan-led and Afghan-controlled reconciliation process” with the Taliban. 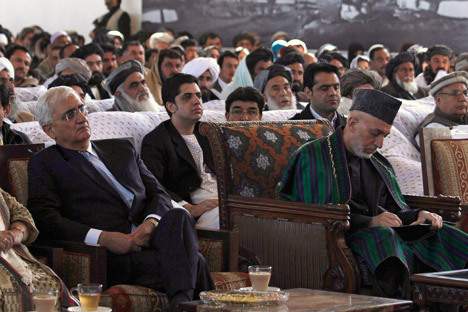 This is despite the US’ covert attempts to portray Karzai in a bad light as a devious, double-dealing personality, and even to undermine these initiatives. Going a step further, Khurshid complimented Karzai for taking such bold initiatives. Four, Khurshid expressly took note of the creditable performance of the Afghan armed forces in these trying months following the NATO’s decision last year to terminate all further combat role in the operations pending the withdrawal of troops by end-2014. This, again, differentiates the Indian stand from the thesis that had gained wide circulation in the recent period that it is the NATO forces that prevent the deluge in Afghanistan. Five, Khurshid stressed unequivocally that India remains committed to strengthening Afghan security and will do all it can within its capability to beef up the Afghan armed forces. Six, Khurshid flagged terrorism as the main challenge ahead and, interestingly, he drew a parallel between the situations that India and Afghan face. This implied reference to cross-border terrorism just stopped short of continued Pakistani support for the Taliban. Indeed, Khurshid failed to refer to the Bilateral Security Agreement [BSA] that the US is pushing for early signature with Karzai and instead he spoke of the imperative need of the international community to continue to render help for Afghanistan’s capacity building and reconstruction. Obviously, India doesn’t see the logic of linking the signing of the BSA with international assistance for Afghanistan. While chatting up the media, Khurshid seems to have hinted that Delhi empathizes with Karzai’s stance apropos the BSA, calling it “more of a fine tuning situation” borne out of “a tremendous amount of confidence” amongst the Afghan forces that they will measure up to the security challenges. It stands to reason that Delhi would anticipate that the BSA might be concluded sometime, but would view it as entirely the prerogative of the Afghan leadership to negotiate with the US. As regards the security situation in Afghanistan, Delhi’s assessment appears to be that history is repeating and once again, like in 1989, Afghan armed forces are showing signs of pulling up their socks once the foreigners left them on their own. Over the weekend, in fact, Afghan security forces conducted some more successful security operations, especially the seizure of a big cache of weapons [http://www.khaama.com/huge-cache-of-taliban-ammunition-explosives-seized-in-kapisa-3440/print/] belonging to the Taliban in Kapisa. All in all, Khurshid’s visit signifies a big gesture of expressing solidarity with Karzai in full view of the Afghan political elites at a time when he has come under immense pressure from various quarters – inside and outside Afghanistan – and is a follow-up of the discussions the Afghan president had with the Indian leadership in Delhi last December. Unsurprisingly, Khurshid did not meet any of the self-styled “frontrunners” in the April election.